* Lesson plan objectives and assessments can be adapted to use this activity with preschoolers and school-age children. Prepare for the activity by creating your “puddles”. 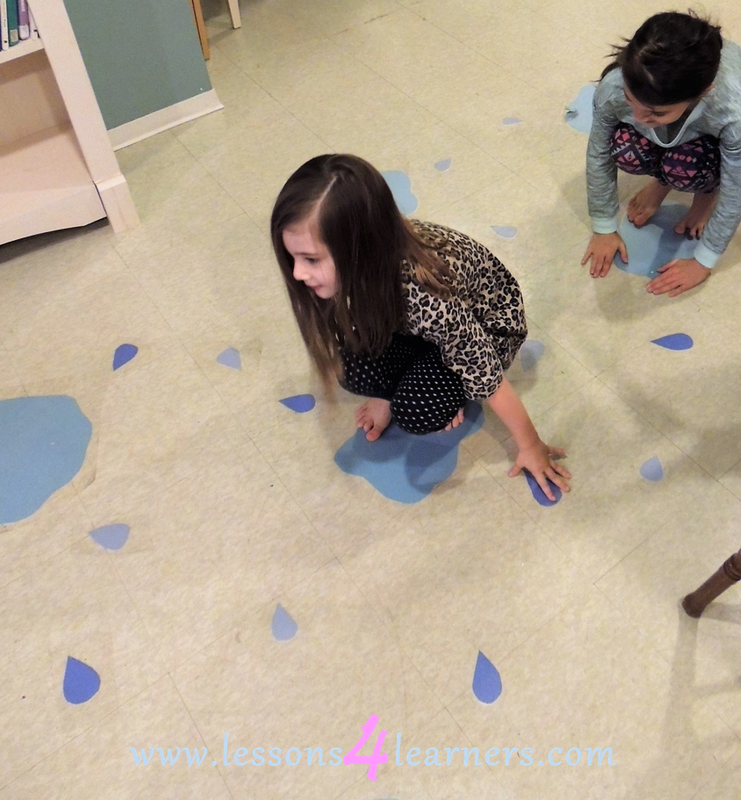 Cut puddle-like shapes and raindrops out of the construction paper and place them on the ground. Cover with contact paper to keep them from moving. Invite the child to jump from puddle to puddle with you. As you are jumping, practice singing the “Rain, Rain, Go Away” nursery rhyme with them. Observe and record the child’s gross motor skills. Were they able to jump from puddle to puddle and land with control? Did they use any of the related vocabulary words or sing the song with you? Music has benefits for a child’s emotional, physical and academic success. Yet it is often put in the category of just plain fun and creative expression. Which of course it is, but music is much more. Children naturally interact with music and some say even before birth. As soon as a child can move they may engage with the music they hear by rocking, bobbing their head, bouncing, dancing, vocalizing or even to sooth themselves. The caregiver can incorporate music for soothing as well; there is something so basic, warm and endearing about holding a child while humming or singing softly. Many children remember information best when it is sung or music is included in the lesson. Music helps build strong bodies when it is used to get kids moving to the point where their heart rate increases for several minutes. Exercise produces endorphin's which support emotional well being, muscle development and spatial awareness. When music is used for group activities or singing together as a group it supports community building and social emotional development. Playing an instrument requires using both sides of the brain simultaneously therefore supporting cognitive growth and also helps with reading and math. Playing an instrument, moving or dancing, and finger songs all support large and small motor development. Playing an instrument, singing, writing lyrics or melodies, following the leader/conductor, works the executive function of the brain. In particular the part of the brain that works with cognitive flexibility, working memory and the speed of processing information. There is no need to be a great musician yourself. Music is about expression more that competency for the young child. The more enthusiastic you are the more engaged the children will be. You might find you are having as much fun as the children.